Mona Lisa, released in 1986 and written/directed by Irish poet and novelist Neil Jordan, shines out as a rough diamond, a masterpiece of British cinema undeniably worthy of its classical title. In one of the most powerful roles of his career, the late great Bob Hoskins stars as George, a low-level criminal who returns from a long stretch in prison and starts trying to put his life together. He has a teenage daughter, who he tries to visit, as soon as he can, only for the scene to degenerate into a violent slanging match between George and his ex-wife. This opening holds in microcosm the complex conflicting elements of George’s character. The lost needy little boy, wanting to return home and clutching a bunch of flowers on the doorstep, becomes filled with seething rage throwing the dustbin at the door and threatening to fight any bystanders who raise a voice. George moves in with his friend Thomas (Robbie Coltrane), who has kept George’s creme 1962 Mark II Jaguar tuned and ready to be driven. That’s fortunate, because George lands a job as a driver for the firm run by Mortwell (Michael Caine) the elusive gangster – now expanded and in the antechamber of the establishment – who George went inside for. George’s job involves picking up and running about a ‘thin tall black tart’, Simone (Cathy Tyson). She works the high-class London hotels and at night insists George curb crawls through King’s Cross where the street walkers roam. The two don’t get on: George is casually racist and worse still ‘cheap’. In a brilliant Pretty Woman reversal, it’s Simone who takes George shopping for clothes and gradually reinvents him into the fantasy image of himself. This doesn’t just mean he ditches his Hawaiian shirt for a double breasted suit. Rather, she also gives him the quest of finding her lost friend Cathy. George, in his suit and with a new purpose of finding a damsel in distress, finally has a life that lives up to his own wounded romanticism, typified by his love of Nat ‘King’ Cole’s music and the detective novels he devours and discusses with Thomas. It’s typical of Jordan’s originality that he doesn’t give them Dashiell Hammett or Raymond Chandler to read but rather the brilliant, enigmatic and surreal John Franklin Bardin. The latter half of the film turns into something like Taxi Driver as George faces up to Simone’s violent ex-pimp Anderson (An early role for The Wire‘s Clarke Peters) and risks the ire of the ‘nasty dirty sleazy’ Mortwell, but Travis Bickle’s Vietnam-inspired madness is replaced by George’s buried decency. “Are you a good man?” his daughter asks. “Not for me to say,” says George. Produced by George Harrison’s Handmade Films and co-written by David Leland, who went on to direct Wish You Were Here the next year, Mona Lisa sees some major British talents at the height of their powers. Bob Hoskins won the best actor award at Cannes, but Cathy Tyson matches him scene for scene, giving an intense portrayal of her doomed beauty. Likewise, Michael Caine produces in Mortwell one of his nastiest and most convincing villains: just watch the turn he takes when questioning an upper class client about a missing girl: “What did you do to her? [Pause] That’s quite alright, sir. We’ll find her.” The look of the film is also gorgeous especially with this new 2K restoration. Terry Gilliam’s favourite cinematographer Roger Pratt takes the images from an initial low key documentary style through the noirish nightmare of Soho sleaze to end up with an almost classical Hollywood framing. Note the final shot of Simone. Michael Kamen scores the movie, excellently placing Cole’s songs and morphing them into a lush dramatic score. 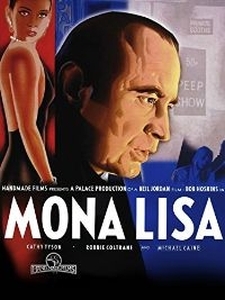 Mona Lisa is a film ripe for rediscovery, its aching melancholy and poetic oddness contrasting perfectly with its genre pretensions and another reminder of how wonderful Bob Hoskins truly was.